Elizabeth Iro started in her role as Chief Nursing Officer of WHO in January 2018. 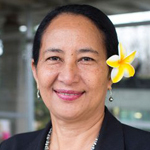 She is from the Cook Islands, Mrs Iro has served as the country’s Secretary of Health since 2012. She was the first nurse/midwife and woman to be appointed in this position. In this role, she has implemented legislative reforms to strengthen the country’s health system and developed the National Health Strategic plans (2012-2016, 2017-2021)and a National Health Road Map 2017-2036, among other National policy and strategic documents. Prior to this role, she served as the country’s Chief Nursing Officer from 2011 to 2012. In addition, for the first 25 years of her career, she was a practicing nurse and midwife, serving in several roles in the Cook Islands and New Zealand.